Researchers surveyed oil spill studies between 1968 and 2015 to characterize the field and describe changes. The team found that, despite its episodic nature, oil spill research is a rapidly expanding field with a growth rate greater than science as a whole. Research attention shifted dramatically to the Gulf of Mexico following Deepwater Horizon, rising from 2% of studies in 2004-2008 to 61% in 2014-2015, making Deepwater Horizon the most studied oil spill. The analyses provided insights into research trends and gaps, particularly a long-standing lack of human health studies (less than 1% of the oil spill literature). 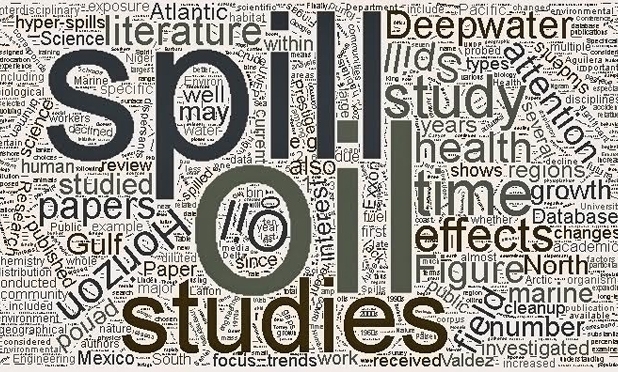 The researchers published their findings in Marine Pollution Bulletin: An in-depth survey of the oil spill literature since 1968: Long term trends and changes since Deepwater Horizon. Word cloud provided by David Murphy.Oil spill impacts on environmental, economic, and public health make them an important research topic for a broad scientific community, including biologists, oceanographers, engineers, chemists, social scientists and economists. 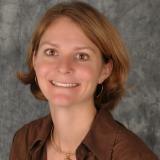 Using the Web of Science database, this study team identified over 11,000 oil spill-related papers. The team randomly subsampled 10% (1,255) of these publications and organized them by discipline, type (laboratory, field, or mesoscale/mesocosm), location, category (literature review or research study), dispersant-related, and specific spill event and then created a publicly available Oil Spill Paper Database, which they used for further analyses. Spikes in academic interest in oil spills coincided with “hyper-spills” that attracted major media and academic attention. The most notable spikes occurred in the early-1970s, 1989-1992, and 2010 to present, coinciding with the Santa Barbara, Exxon Valdez, and Deepwater Horizon spills, respectively. These events drove the geographical focus of oil spill research, with a notable shift away from the North Atlantic and North Pacific to the Gulf of Mexico. The focus on hyper-spills appeared to generate a boom and bust cycle in interest and funding. Implications of this cycle may include the loss of hands-on experience between hyper-spills and increased time launching new research programs during boom phases. The proportion of biological and physical studies remained generally consistent over time, with biological studies comprising about one third of oil spill research. Chemistry studies after the mid-1970s maintained a 25-30% share, but dipped recently to 20%. Physical studies remained fairly consistent at 10-15%, and engineering studies increased after the late 1990s to 10-15%. Modeling studies were the least common through the early 1980s (<10%), but grew and maintained a 10-15% proportion afterwards. Interdisciplinary studies grew from 20-30% in the 1970s to 40-50% in the 2000s. Review papers fell from 10% to 5%. Studies considering dispersants doubled to 20% recently, and those involving a field component rose to over 70% in the early 1980s, then declined to 45%. Human health, certain geographical regions, and oil types such as diluted bitumen and fuel represent gaps in current oil spill literature. Estuarine, brackish, riverine, and freshwater environments received less research attention than coastal and pelagic environments. Oil spill impact studies focused more on microbes, invertebrates, and fish than on plankton and protozoa. There has been growth in the oil spill research community, particularly graduate student involvement since Deepwater Horizon. The growth in the oil spill research field suggests that scientists, policy makers, and responders may be better equipped to understand and respond to future spills. The Oil Spill Paper Database is publicly available through the Gulf of Mexico Research Initiative Information and Data Cooperative (GRIIDC) website at doi:10.7266/N7SN06Z4. The study’s authors are David Murphy, Brad Gemmell, Liana Vaccari, Cheng Li, Hernando Bacosa, Meredith Evans, Colbi Gemmell, Tracy Harvey, Maryam Jalali, and Tagbo H.R. Niepa.